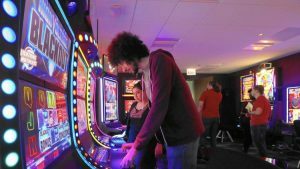 Slot machines aren’t the most-difficult games to navigate in the casino. However, it never hurts to consult a beginners slots guide when learning the ropes. Doing so helps you figure out how to choose the right casinos and betting options that suit your bankroll. Keep reading as I cover the important essentials you should know before playing slots. Online or Land Based Casino? The slots world offers two distinct places to play: online and land-based casinos. Online casinos are perfect with regard to convenience. You can play at these sites via your smartphone, tablet, or PC. Brick-and-mortar casinos require you to travel, even if it’s a short distance. But the benefit is that you get the full casino experience. Many slot machines give you options with regard to the betting process. These options include everything from adjusting paylines to the coin size. Take time to understand the betting process before making a single spin. After all, you don’t want to risk more than you’re comfortable with. A bankroll is a predefined gambling fund. You never want to lose more than your bankroll, because it means that you may be dipping into personal funds. Choose an amount of money that you’re comfortable gambling with. This amount should be funds that you’re willing to lose in case things to south. Also figure out how much you’re willing to lose in a single session. For example, you might be comfortable risking $50 of your $500 bankroll per session. Return to player (RTP) refers to how much a slot machine pays back. This effectively determines your chances of winning. Most online slots offer between 94% and 97% RTP. Land-based slots can pay anywhere from 88% to 96% RTP on average. Internet slots have an inherent advantage here, because most developers publicly display RTP. Land-based slots, in contrast, don’t make this info available.